To treat dogs with shattered facial bones, veterinary orthopedist Randy Boudrieau has taken a page from human medicine, using titanium plates narrower than a pencil to repair the fractures. Facial fractures are common in humans who fly through a windshield in a car accident, says Boudrieau, a professor at Cummings School. But these injuries are pretty rare in dogs, he says, so most veterinarians have limited experience treating them. Canine facial fractures may be left to heal on their own if they are relatively stable, or they may be wired together if the bone fragments are large enough. However, these techniques often aren’t effective with bones that break into many small pieces. Using a similar technique, Boudrieau mapped the location of canine buttresses by installing a Christmas tree light inside a dog skull and taking photographs. (He was caught, red-handed, by his wife on Christmas day.) His findings have been published in several veterinary textbooks and journals. He then evaluated the effectiveness of different titanium plates used in human and veterinary medicine to repair facial fractures that involved many small pieces. Boudrieau found that similar to human medicine, plates that can be bent three-dimensionally work best. 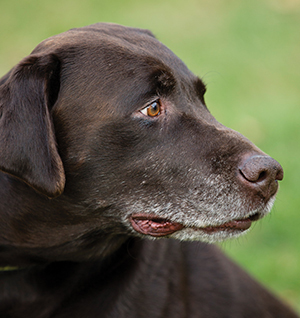 In his most recent case, published in Veterinary and Comparative Orthopaedics and Traumatology in August 2014, he treated a 4-year-old Labrador retriever brought to the Foster Hospital for Small Animals after being hit by a car. The dog, named Burton, had multiple fractures of his face, including the nose, cheek and eye socket. His maxilla (essentially the snout) had separated from the base of his skull. In the OR, Boudrieau lined up Burton’s facial bones with the jaw by using the places where the upper and lower teeth would normally come into contact as anatomic landmarks. “The whole idea is that you work on the simplest fracture first and gradually proceed sequentially through the more difficult areas,” he says, while “trying to stay in the areas of the thicker bone—aka the buttresses.” During the five-hour operation, Boudrieau implanted 10 titanium plates.